Is the Interstitium Really a New Organ? A study confirms that the spaces between cells are fluid-filled, rather than tightly packed with connective tissue, but pathologists say the findings’ implications remain to be seen. 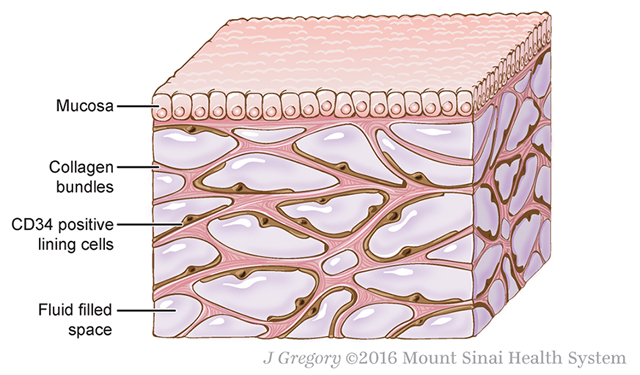 Illustration of the interstitium, fluid-filled spaces supported by a network of collagen bundles, lined on one side with cellsJILL GREGORY, REPRINTED WITH PERMISSION FROM MOUNT SINAI HEALTH SYSTEM, LICENSED UNDER CC-BY-ND.For years, scientists have fixed tissue and looked at it under the microscope in order to better understand the body. In a study published yesterday (March 27) in Scientific Reports, a team of researchers used a new in vivo microscopy technique to present evidence that the human interstitium—the space between cells—is more like a matrix of collagen bundles interspersed with fluid than the densely-packed stacks of connective tissue it appears to be in fixed slides. 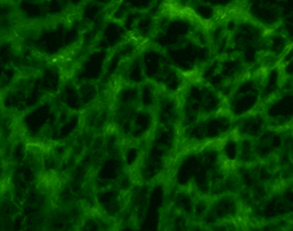 News reports have suggested that this interstitium could represent a widespread organ in the body, whose connections with the lymphatic system might be involved in cancer metastasis. While researchers not involved in the study agree that the interstitium likely plays diverse roles in the human body, they are reticent to call it a new organ. “It is fair to say that histologists [and] pathologists have long known that there is an interstitial space and that it contains fluid,” Anirban Maitra, a pathologist at the University of Texas MD Anderson Cancer Center who did not participate in the work, writes in an email to The Scientist. 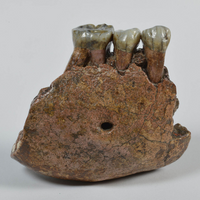 “The claim that it is a hitherto undiscovered organ, and the largest one ever at that, seems a stretch,” he cautions. 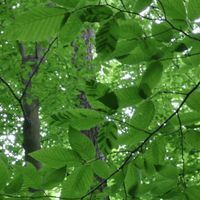 “Most biologists would be reticent to put the moniker of an ‘organ’ on microscopic uneven spaces between tissues that contain fluid. By this definition, the abdominal cavity and pleural spaces should be discrete organs” too, says Maitra. 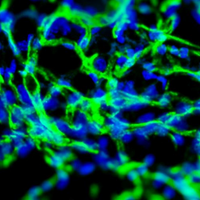 Frozen human bile duct tissue imaged by fluorescence microscopy demonstrates the net-like pattern in the connective tissue of the interstitium.BENIAS ET AL., SCIENTIFIC REPORTS, 2018. According to coauthor Neil Theise, a pathologist at New York University’s School of Medicine, coauthors and physicians Petros Benias and David Carr-Locke consulted with him after they saw something unexpected while using a technique called probe-based confocal laser endomicroscopy to assess patients’ bile ducts for cancer spread. The endoscopic method allows for the exploration of living tissues within the body, rather than needing to wait for fixed slides. Benias and Carr-Locke noticed that bile duct tissue appeared as a net-like pattern that did not correspond to any anatomical structure that had been previously described. When Theise looked at fixed bile duct tissue under the microscope, he didn’t see the pattern. But when the team examined live and freshly frozen bile ducts from 13 patients, there it was, an extended latticework of tissue. Upon further scrutiny, they determined that the lattice is composed of collagen bundles that support fluid-filled spaces and are lined irregularly with flattened cells that produce two markers, one endothelial and one mesenchymal. The researchers saw the net-like interstitium in other areas of the body, including the skin, the digestive tract, and the bladder. Histological examinations of colon, stomach, and skin cancers that had metastasized seemingly directly from the interstitial space to the lymph nodes suggested to the authors that the interstitium drains into the lymphatic system. The authors propose in the study that this connection between the interstitium and the lymphatic system could explain how some tumors rapidly metastasize once they reach the fluid-filled space. Image of fresh-frozen human bile duct (left) shows collagen bundles in blue; the asterisks mark fluid-filled spaces of the interstitium. Images of a fixed bile duct from the same patient (upper and lower right) show the collapse of spaces (arrowheads in bottom panel) and collagen bundles sticking together. BENIAS ET AL., SCIENTIFIC REPORTS, 2018. The study makes a good point that it’s important to consider to what degree the microscopy techniques currently in use reveal a true-to-life picture of what is happening in vivo, Radu Stan, a biologist at Dartmouth’s Geisel School of Medicine who did not participate in the work, tells The Scientist. 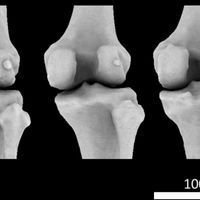 He adds that the concept of a fluid-filled matrix is not “earth-shattering,” and that sectioning and imaging unfixed tissue as the authors did, which could tear and create artifacts, presents limitations. “The paper presents an interesting description of a possible novel microanatomic structure of ‘pre-lymphatic’ or ‘interstitial’ spaces in normal tissues, which may play a role in normal function as well as tumor metastasis,” Xiaoyin “Sara” Jiang, a pathologist at Duke University School of Medicine in North Carolina who was not involved in the work, writes in an email to The Scientist. She cautions that the findings are limited to a fairly small number of patients and that most of the tissues the authors looked at outside of the bile duct were fixed, not live or freshly frozen. Overall, the work opens the door to additional study—in the hands of another group, as well as studying pCLE in other tissues—rather than being definitive, she writes. 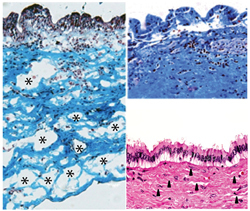 Theise and colleagues are already investigating the developmental anatomy of the interstitium in mice, as well as looking more in depth at how it appears in other tissues in both animal models and people. Other future directions include the role of the interstitium in diseases, including cancer and liver disease. P.C. Benias et al., “Structure and distribution of an unrecognized interstitium in human tissues,” Scientific Reports, doi:10.1038/s41598-018-23062-6, 2018.